Ever since I finished reading “Tales of the Marriage Bed from Medieval France (1300-1500)” by R. C. Famiglietti, I’ve been searching for a copy of “Royal Intrigue”. I wasn’t having any luck as no library near me had a copy and the rare copies I could find for sale were ridiculously expensive. With persistence, I kept checking various used book outlets and as luck would have it, I found an affordable used copy of this book. Famiglietti’s approach to history and his writing style are very hard to resist. And the subject of the mental health of King Charles VI France intrigues me greatly. 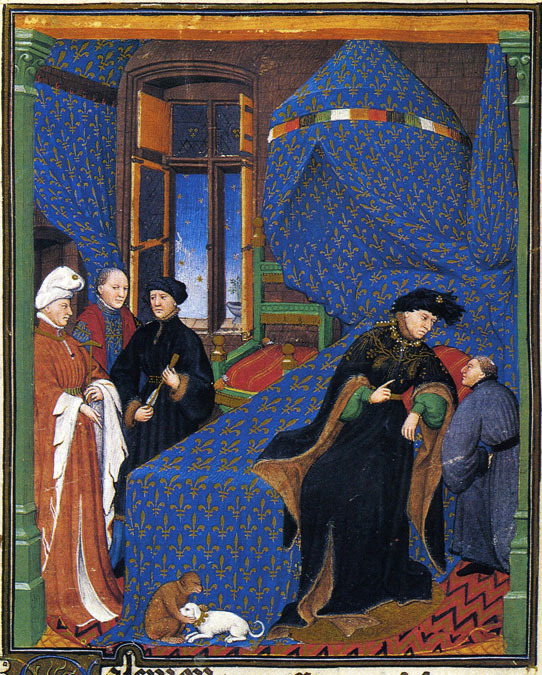 It stands to reason any insight into the illness of Charles VI would have a bearing on that of his grandson, King Henry VI of England who suffered a similar disorder. As I opened the book, it became clear I had hit the jackpot. The first chapter is titled “The Mental Disorder of Charles VI”. While it is impossible for anyone to diagnose a subject that lived over six hundred years ago, Famiglietti gives a very convincing argument. He first recounts the historical records from the chroniclers who describe Charles VI’s behavior to come up with a list of symptoms. He then consults with the Diagnostic and Statistical Manual of Mental Disorders to see what illness matches these symptoms. His theory is some form of schizophrenia because he exhibited three out of the five defining factors for this illness. Within the diagnosis of schizophrenia, there are several different types. Charles exhibited symptoms that overlapped with these different types but Famiglietti recognizes an underlying theme: persecutory delusions. After doing this detective work in psychiatry, Famiglietti gets to work writing about the different factions at the French court and how they schemed and plotted to take power while the king was incapacitated and how his persecutory delusions dictated the king’s reactions to these different schemes and events. Here we meet the major characters: Louis of Orléans and his son Charles, Duc d’Orléans, Queen Isabeau of Bavaria, the Dauphin Louis, Duc de Guyenne, the king’s eldest son, King Henry V of England and John the Fearless, Duke of Burgundy to name only the most important. The opening salvo is the first psychotic episode Charles suffered in the summer of 1392 when he went berserk and killed four or five people. While he never had another attack this severe, for the rest of his life he moved in and out of calm and manic bouts, all the while suffering from the persecutory delusions. Famiglietti knows his sources and is able to reconstruct the history day by day if not down to the hour. He can tell when the king was having a good and bad day with his illness. He mentions letters which were issued either only in the king’s name or with the king and the council or letters written by other parties in the fight. He sometimes tells us where the principal character ate dinner and when they left to travel elsewhere in the kingdom. He has such wonderful insight into the personalities of the main players and even corrects other historian’s work where he thinks they have been mistaken in their conclusions. All of this is pretty fascinating stuff! He covers the murder of Louis of Orléans and the assassination of John the Fearless. He explains the circumstances that led to the Treaty of Troyes in 1420. Other than the first chapter on the mental illness of the king, the best chapter is the one in which he describes the Cabochien Uprising of 1413. The royal family must have been scared out of their wits when John the Fearless goaded the butchers and other merchants to revolt. They entered the actual palaces and even took prisoner some of the Dauphin’s servants and had them executed. The Dauphin would work against the Burgundians and the Armagnacs from that point forward until his untimely death shortly afterward. I loved this book just as much as the “Tales of the Marriage Bed”. In doing some research into R.C. Famiglietti, I was unable to find out any information on the man himself. He was a professor at the City University of New York when he wrote these books in the 1980’s but I have no idea where is now. He is a very unique and innovative historian as well as a great writer. I plan on digging to see if he wrote any other books or articles and try to read more. This entry was posted in Book Reviews, Medieval History Books and tagged book review, Charles Duc d’Orléans, Crisis at the Court of Charles VI, Duke of Burgundy, French history, Hundred Years War, John the Fearless, King Charles VI of France, Louis Duc d’Orléans, medieval history, Queen Isabeau of Bavaria, R.C. Famiglietti, Royal Intrigue. Bookmark the permalink. I really really want to read that, but it’s blastedly expensive on Amazon! Where on earth did you get your hands on it? I kept an eye on ABE Books website for the book. Apparently a university library divested itself of the book and I was the lucky winner of the lottery. It was still expensive but it was worth every penny!